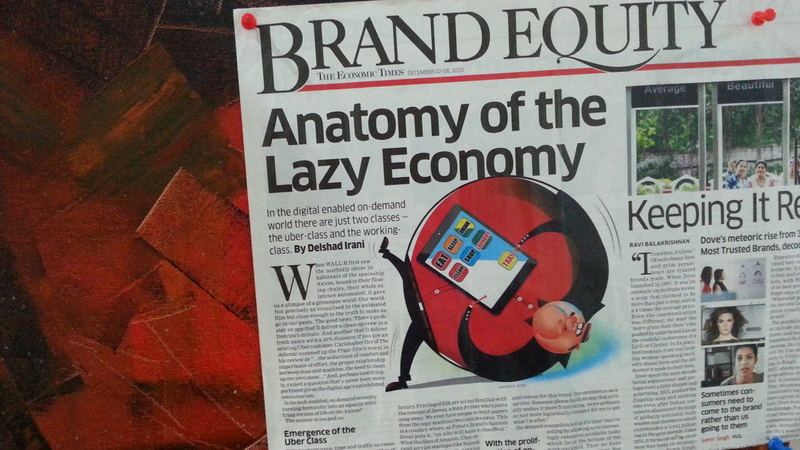 An article on Brand Equity of The Economic Times flashed a front page headline “Anatomy of the Lazy Economy.” Among other things, it talked of changes in consumer behavior and expectations over the past years with the rise of ecommerce. We had a discussion on that and also about how hyperlocal is at a tangent from traditional ecommerce. The Indian e-commerce industry is poised to cross USD 100 billion by 2020 – Assocham-PwC study. Experts are of the view that online grocery will become one of the top three most attractive segments for online retailers, after electronics and apparel. Is ecommerce making us a lazy society? Frankly, we don’t think so. Those who were lazy continue to be lazy in the ecommerce era. But for others, ecommerce, especially offerings such as groceries, is like a lifeline. Online shopping saves you from mundane, repetitive, brainless tasks that take precious time out of your day. It’s convenient, doesn’t force you to brave the killing traffic … you could even say, eases the traffic with so many “online shoppers” off roads! Doesn’t it make sense to spend time on more quality activities – time with your children, spouse or extended family; working on a hobby; pursuing personal or professional goals, etc. Furthermore, ecommerce is giving people with low grade skills an affordable and convenient platform to earn more and also, build social stature. The above mentioned article talks about how a “dhobi” (people who iron and/or wash clothes) joined the Wassup platform on the condition that he get a corporate ID card which would give the required social status to get a bride. In fact, he announced his wedding 4 months later! Hyperlocal online businesses are growing at a remarkable pace in India. And they work! But first, let’s define hyperlocal. support local neighborhood stores, mom-and-pop shops, etc. As per a Financial Express article Much Ado About Hyperlocals, these services have higher margins of around 20% as opposed to product based models which earn 2-10% margins or even non-hyperlocal e-commerce companies, which operate on 3-7% margins, depending on the category. Hyperlocal startups are giving ecommerce some stiff competition as well. Read more: How hyperlocal startups are giving e-com giants a run for their money. Russsh – tasks – virtual assistance. Flipkart reportedlyconsidering entering the online grocery delivery space. Delyver – recently bought by BigBasket. Amazon’s KiryanaNow – aims to deliver the goods “within 2-4 hours” using its own logistics, the neighbourhood store’s staff, or one of its logistics partners. Paytm launched Zip mobile app, tested in Bengaluru and then pulled back for a more feature packed release. Ola launched Ola store, a hyperlocal grocery mobile app. SeniorShelf – for senior citizens – offers toilet seats, commodes, walking support, arm support, etc. com – enter location and find food cooked by home chef’s near you. In fact watscooking caters not only to some non-metro cities in India such as Eluru, TN; Kurnool, AP; but also UAE, UK, US, Canada, Malaysia, etc.! These come from Alagu Balaraman, partner and MD, Indian operations, CGN Global India, a supply chain management consulting firm, picked up from the FT article again. Training of people in services is very difficult as each individual has to be available wherever the customer is located. Service people must know how to handle a customer – he represents your brand. Services industry is rather fragmented, it is difficult to form partnerships with associations or groups of such service providers, as specialists are spread out across the country. Creating a need for services might be difficult as people may already have their own local set-up in place – but that mindset is changing. Google is a growth engine for Indian business – Find out how Google is helping Indian SMBs grow. Digital India with Google – Translating the vision of connected India – Google launches a dedicated destination (g.co/digitalindia) to capture how the digital revolution is unfolding in India. Facebook is running ads on Facebook targeting its 25% woman demographic in India – check out this video and this one. Lots of stuff for you to get into! Till the next podcast … have a good one!